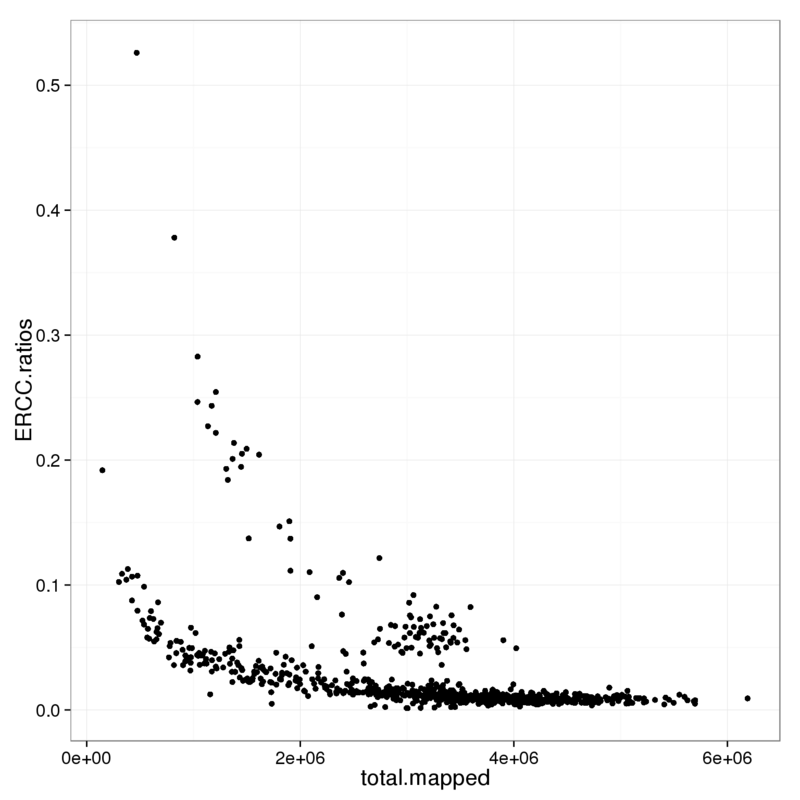 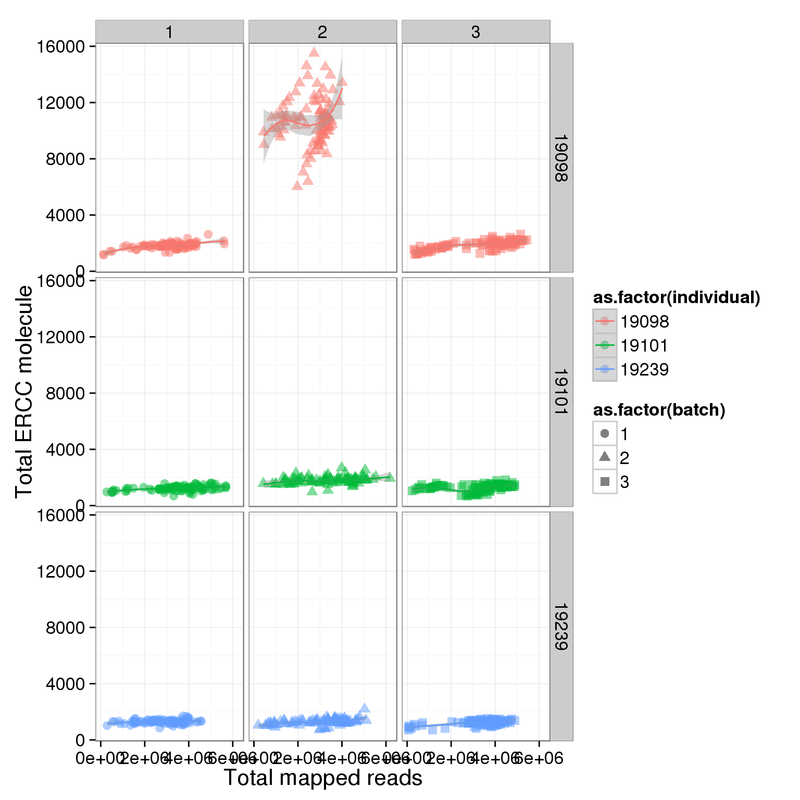 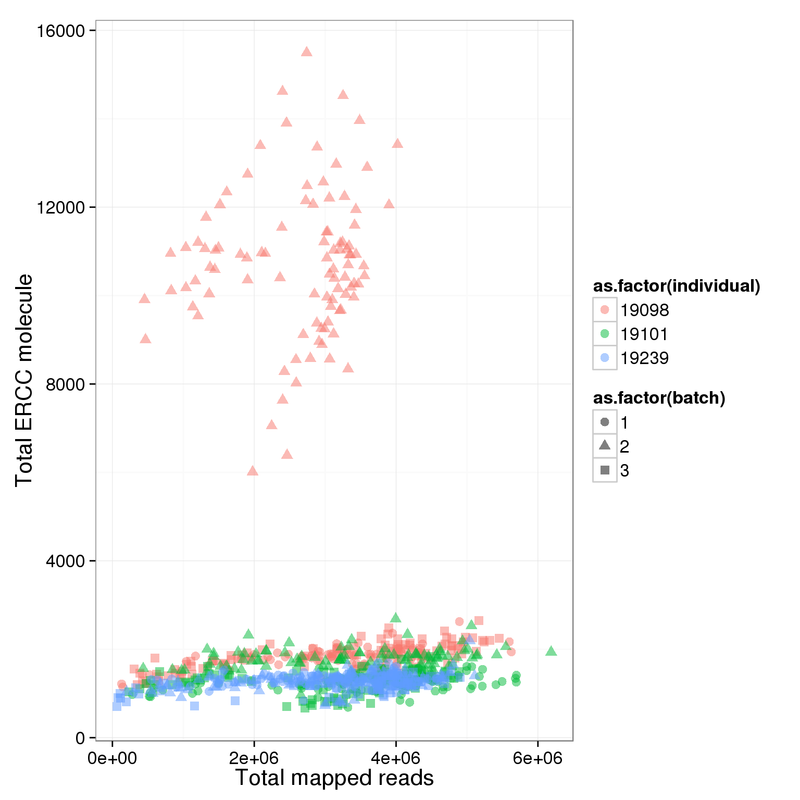 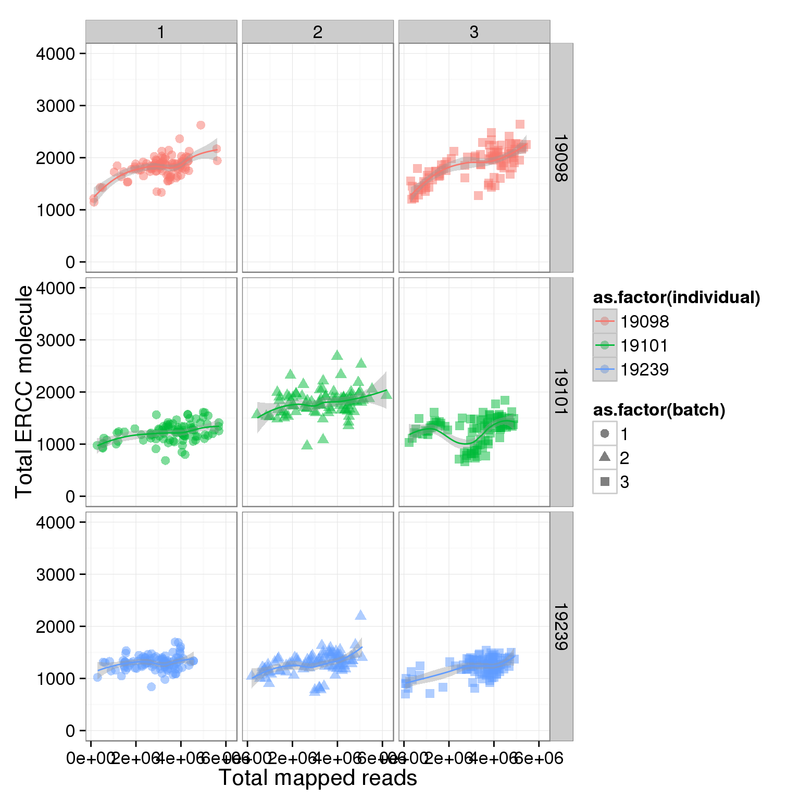 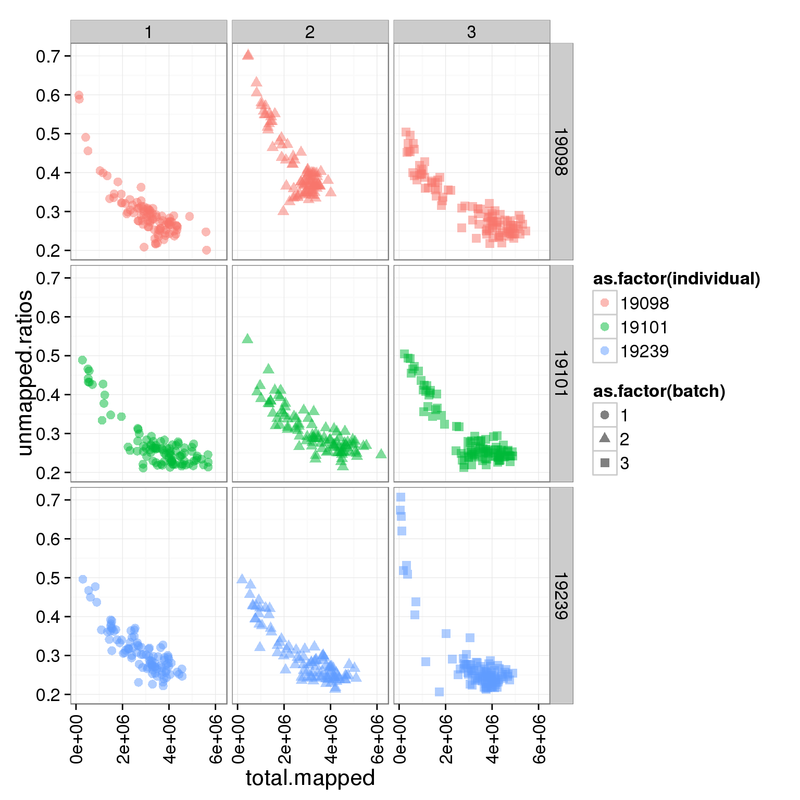 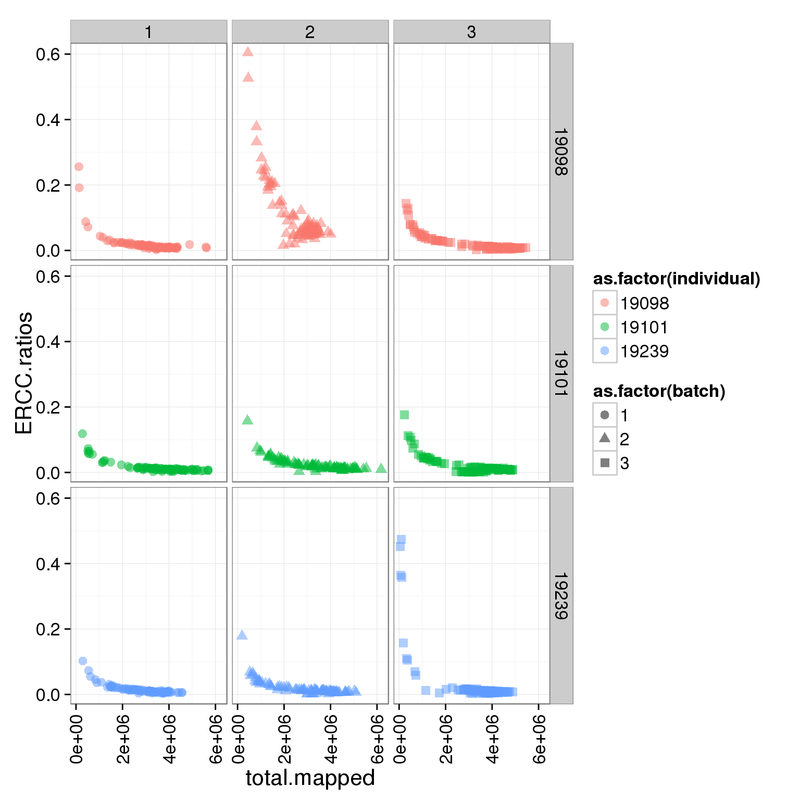 Looking at the unmapped ratio and ERCC ratio of each cell based on number of reads. 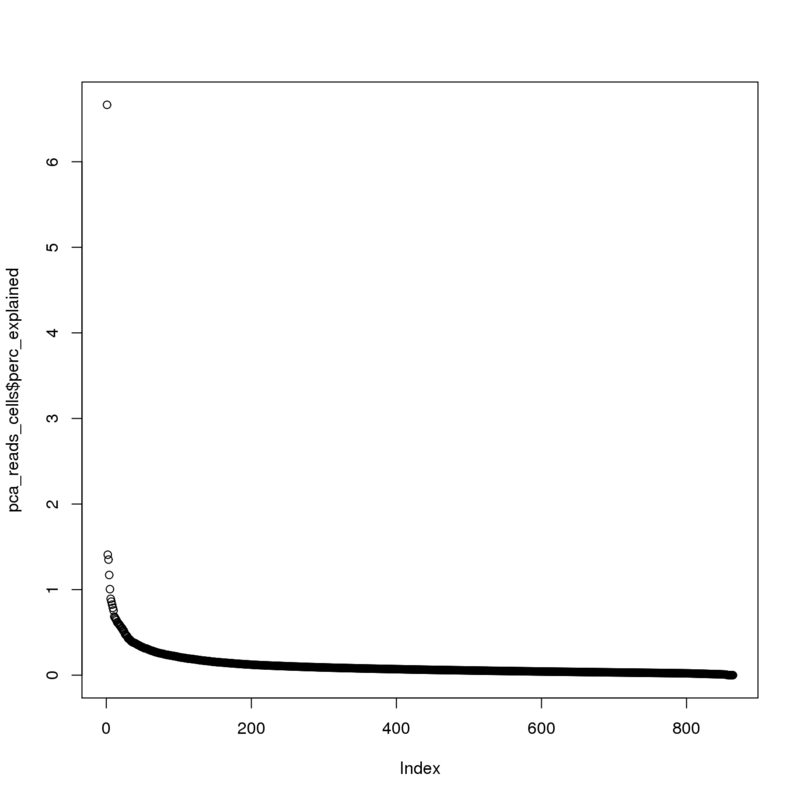 Warning: Removed 96 rows containing missing values (stat_smooth). 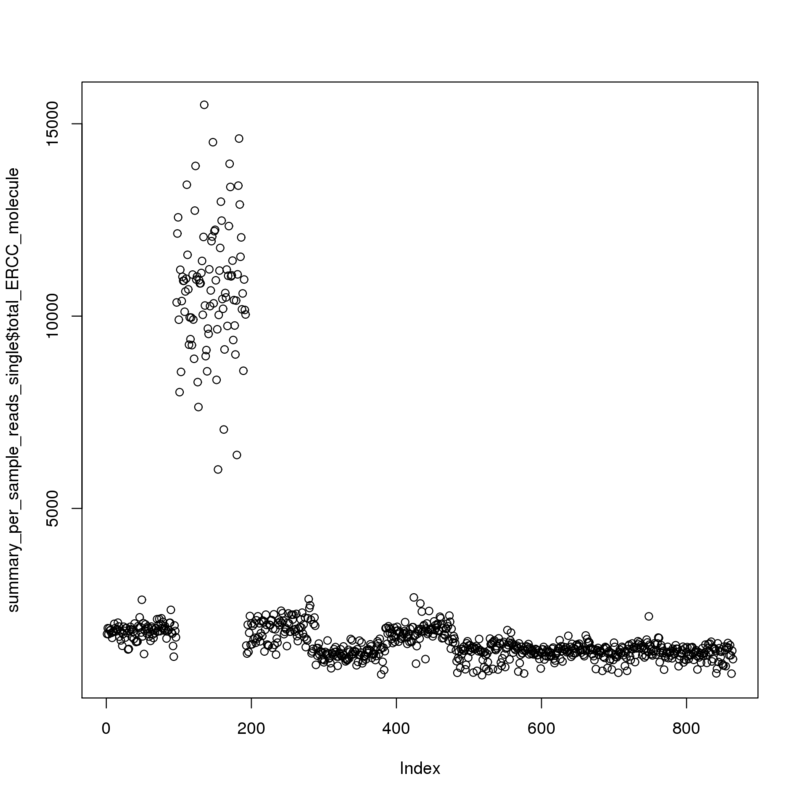 Warning: Removed 96 rows containing missing values (geom_point). 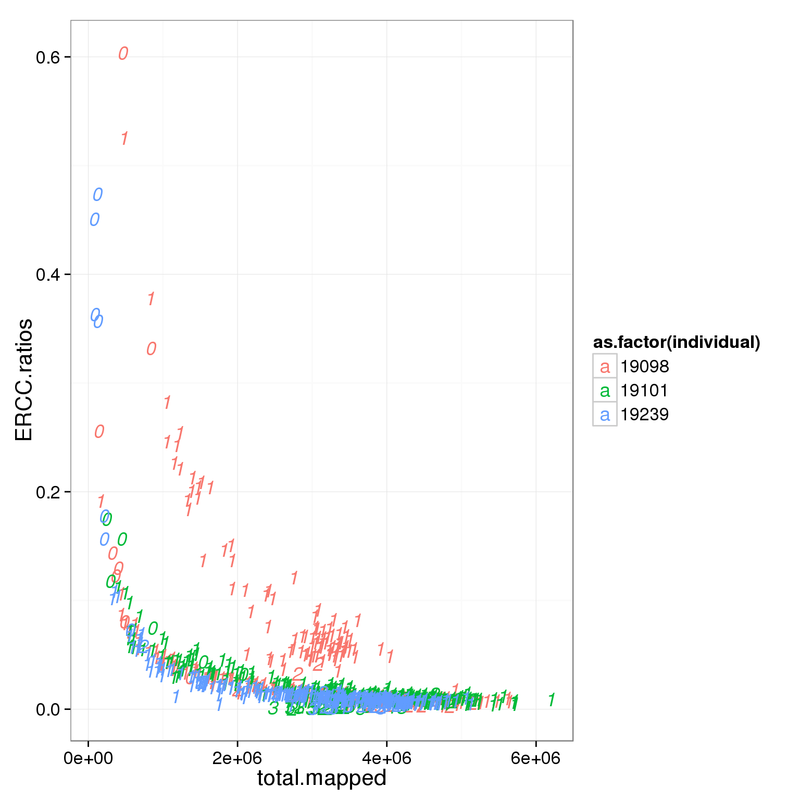 It is obvious that the 19098 batch 2 have a lot more ERCC than all the other. 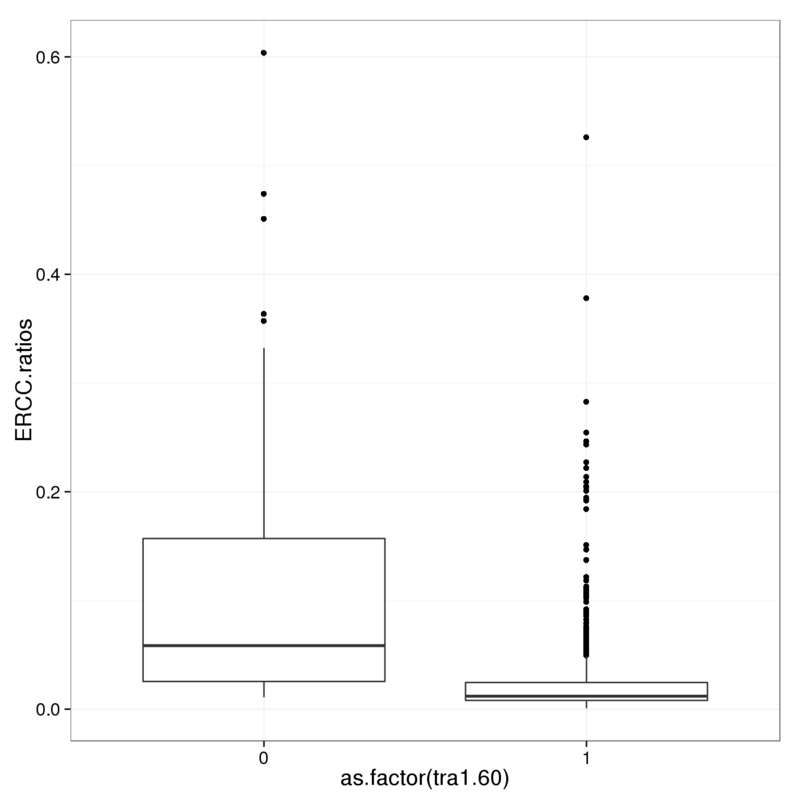 Here is trying to fix it by adjusting the ERCC of the super sad batch. 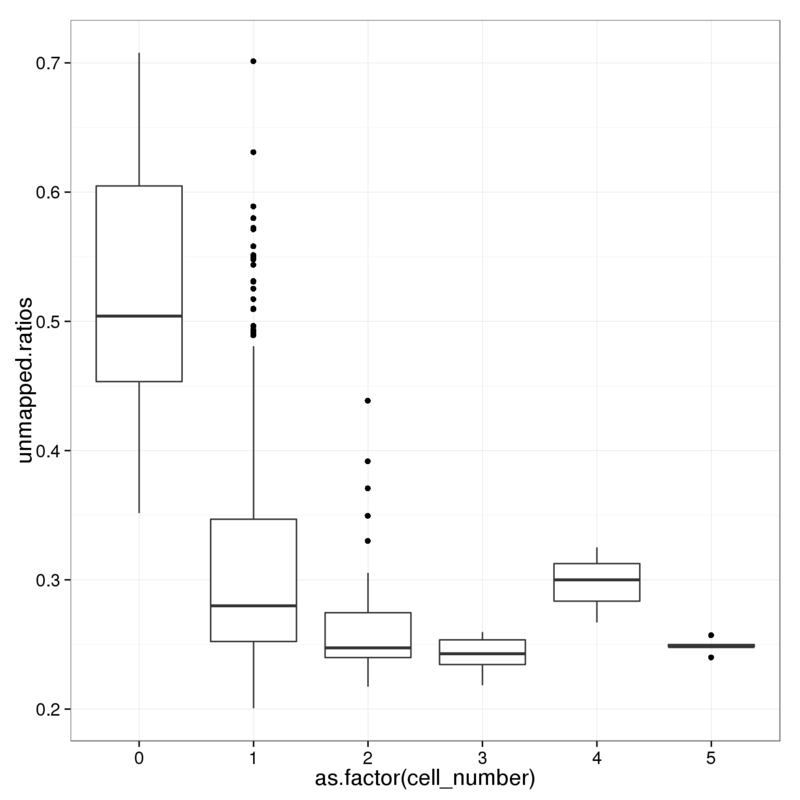 The cell number of each capture site is recorded after the cell corting step and before the cells got lysed. 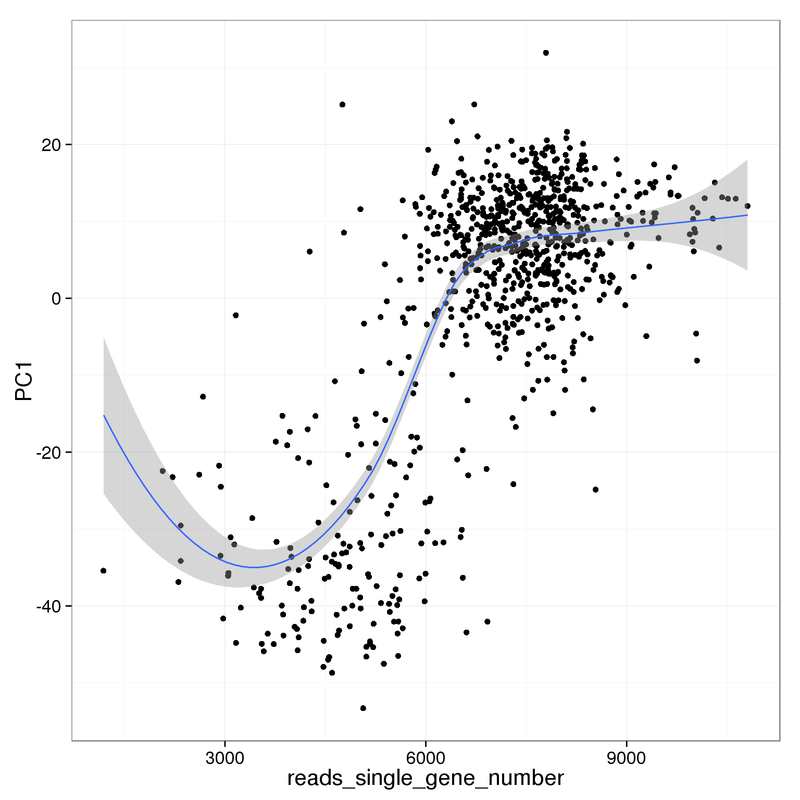 Based on the observation that these is a dinstint cell population with more than 1.5 million reads, we used it as a cutoff. 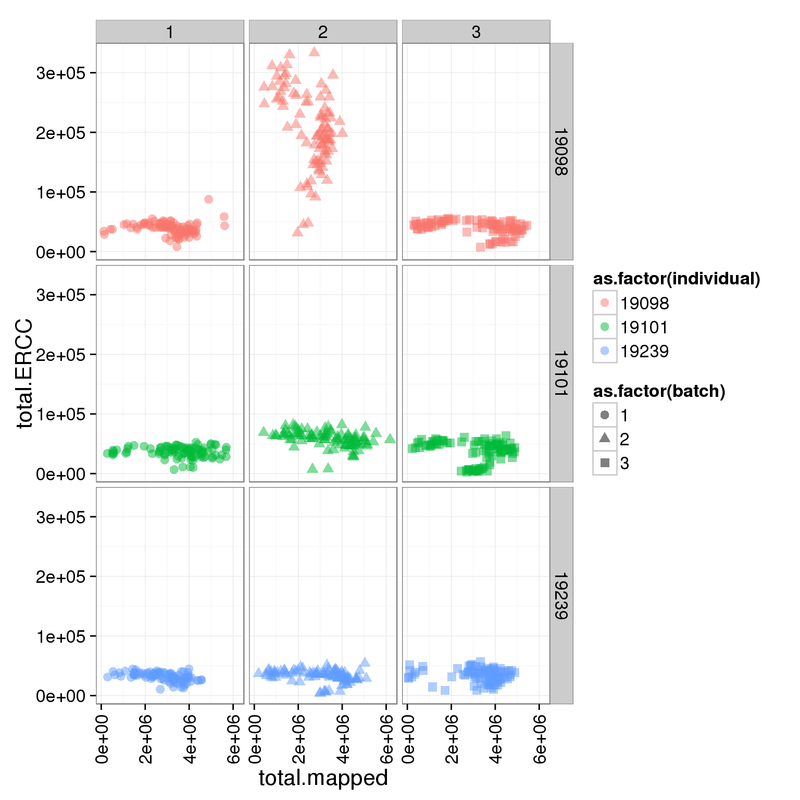 Tra-1-60 is a stem cell marker. 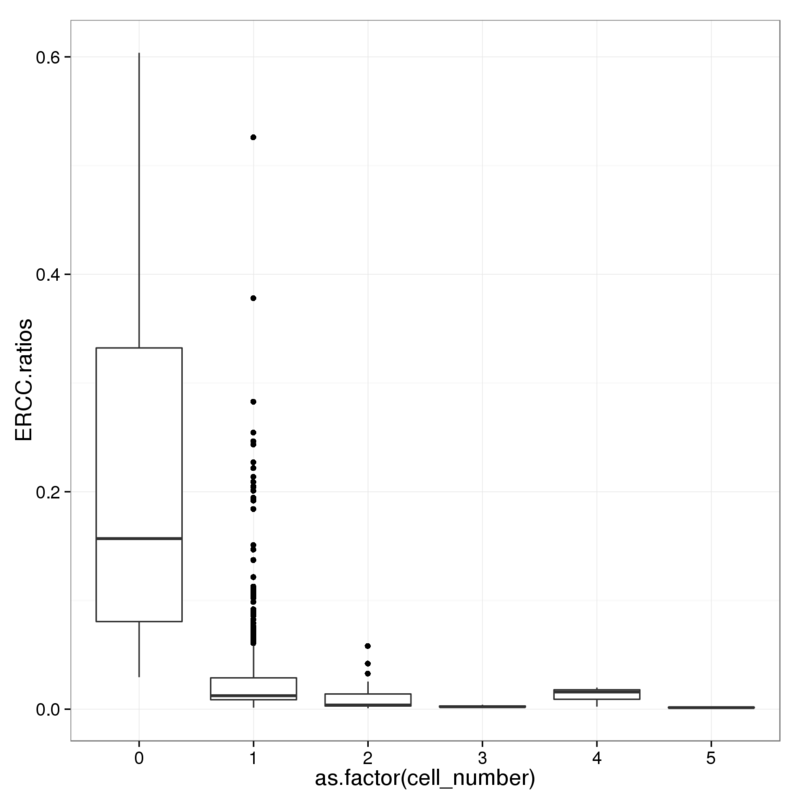 Simply removing all the cells with bad cell number or tra-1-60 does not remove all the low quality samples. 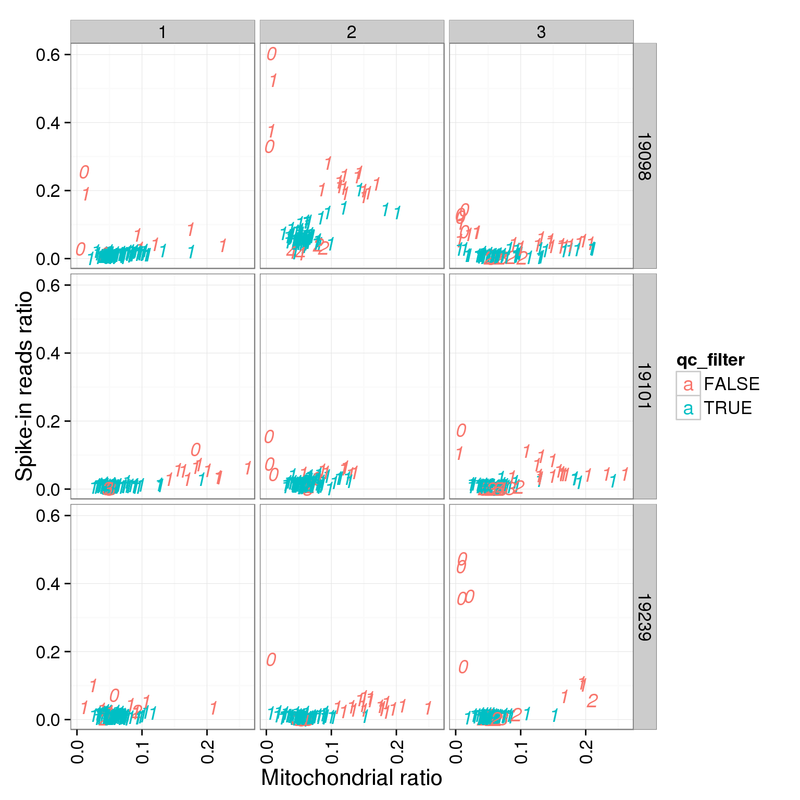 Calculate the counts per million for the singe cells. 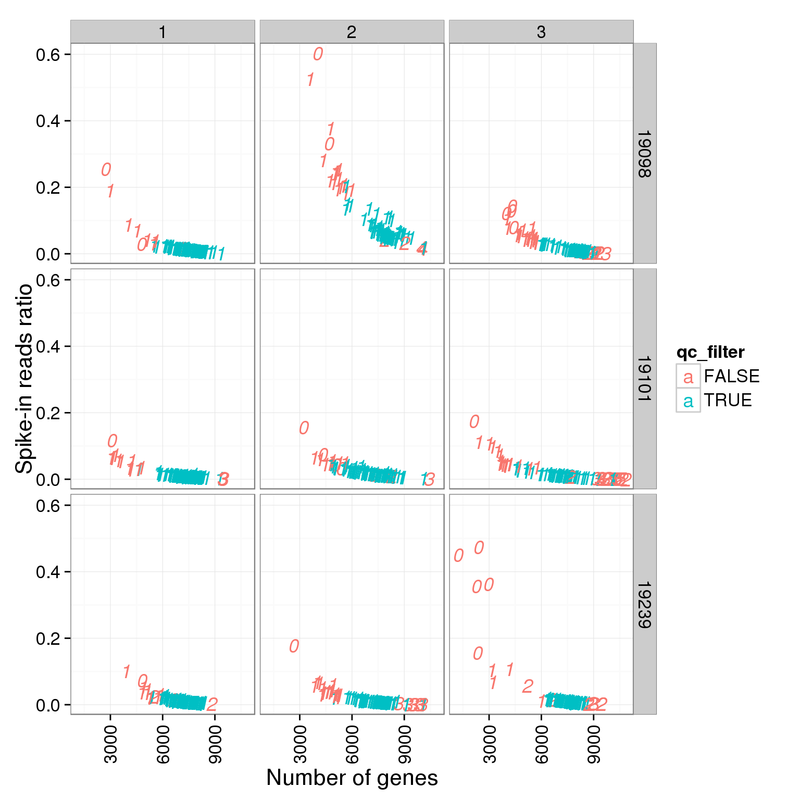 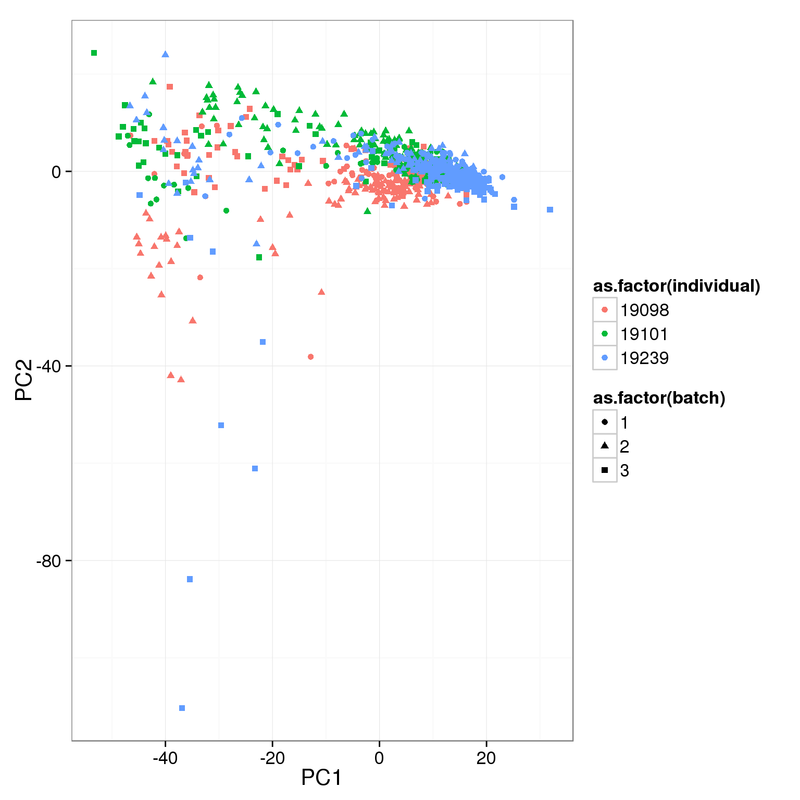 Select the most variable genes. 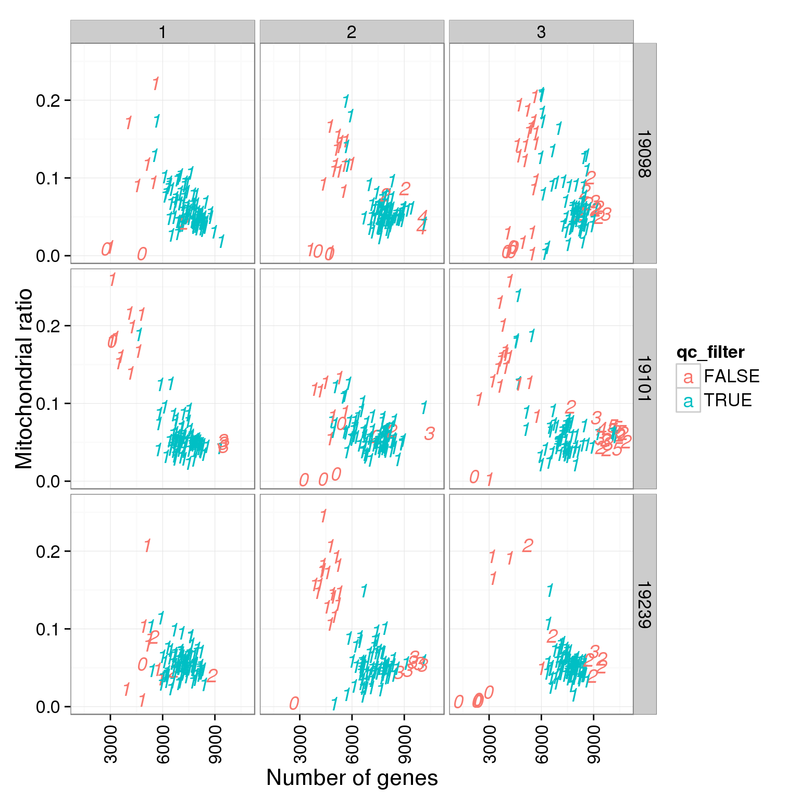 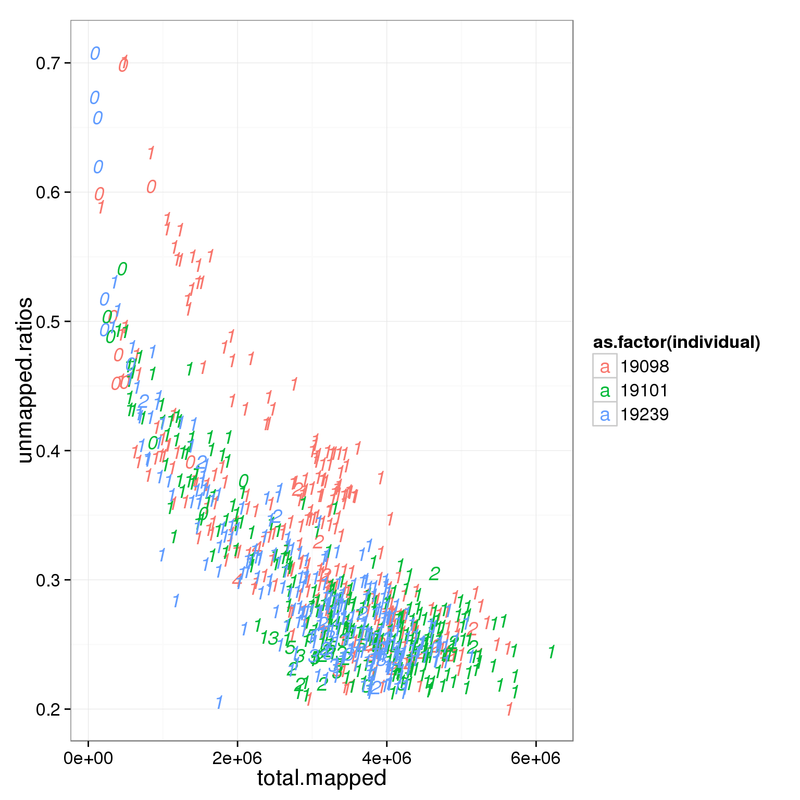 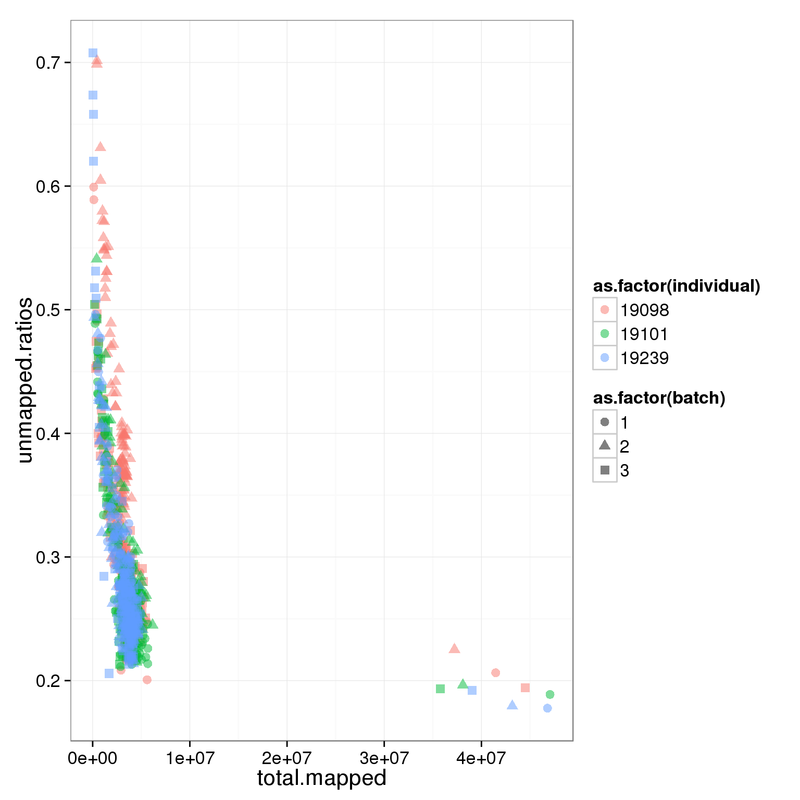 Using the 4689 most variable genes, perform PCA. 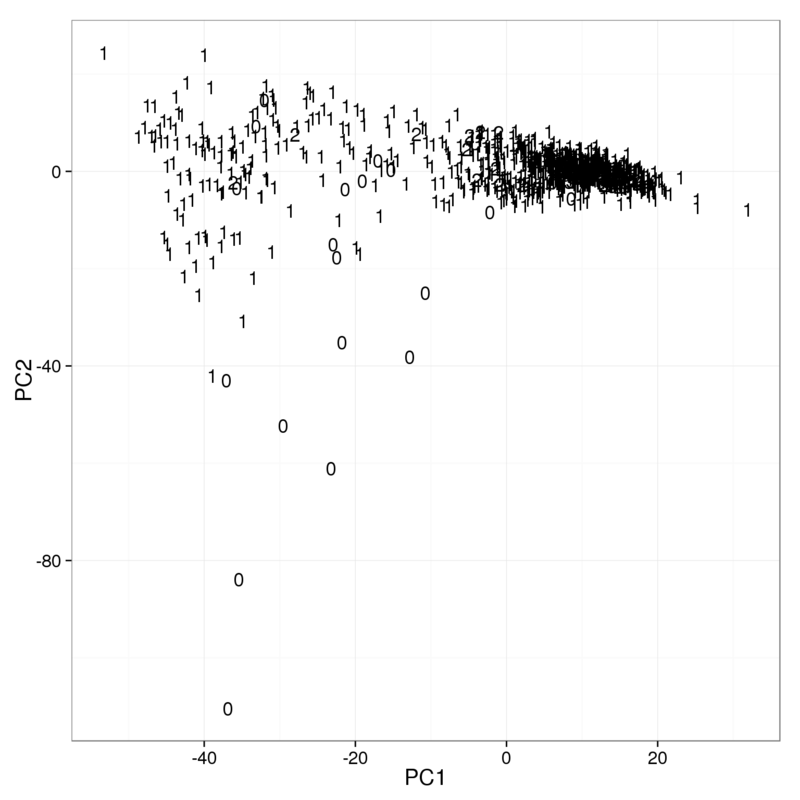 The first PC accounts for 7% of the variance and the second PC 1%. What effect is PC1 capturing? The outliers on PC2 are mainly empty wells. 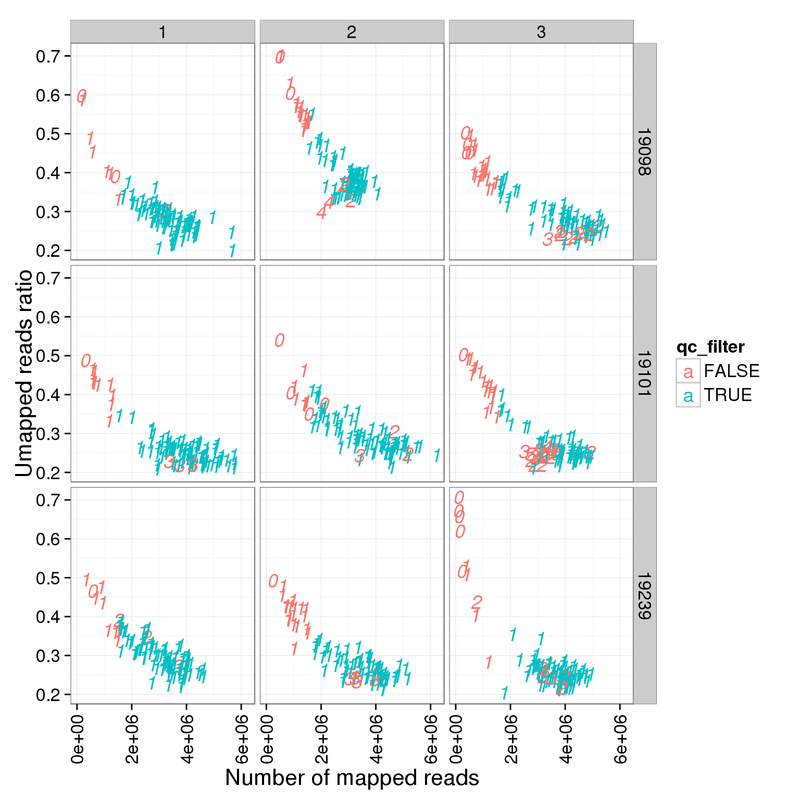 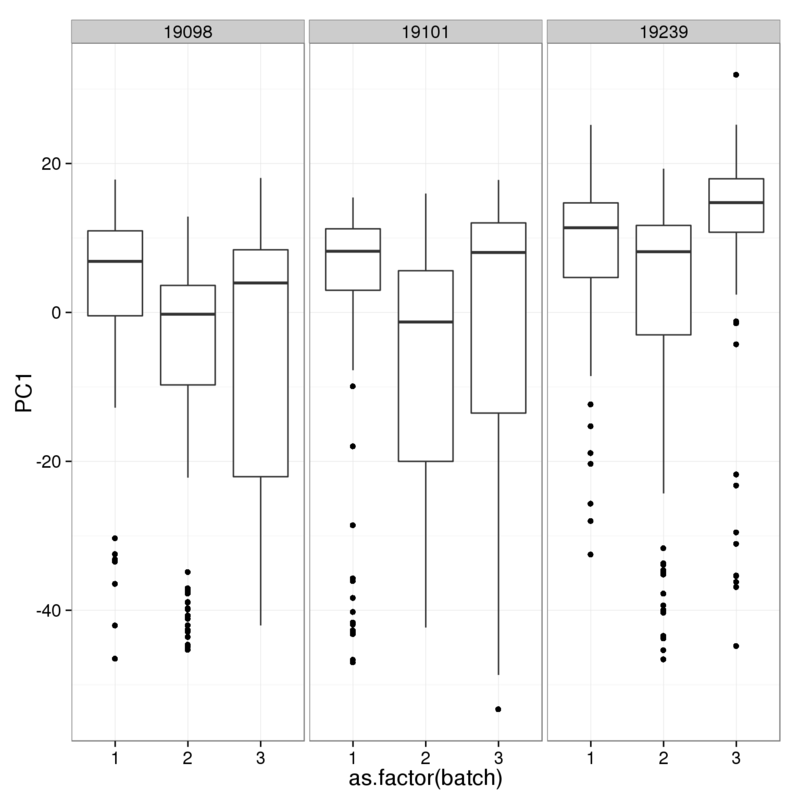 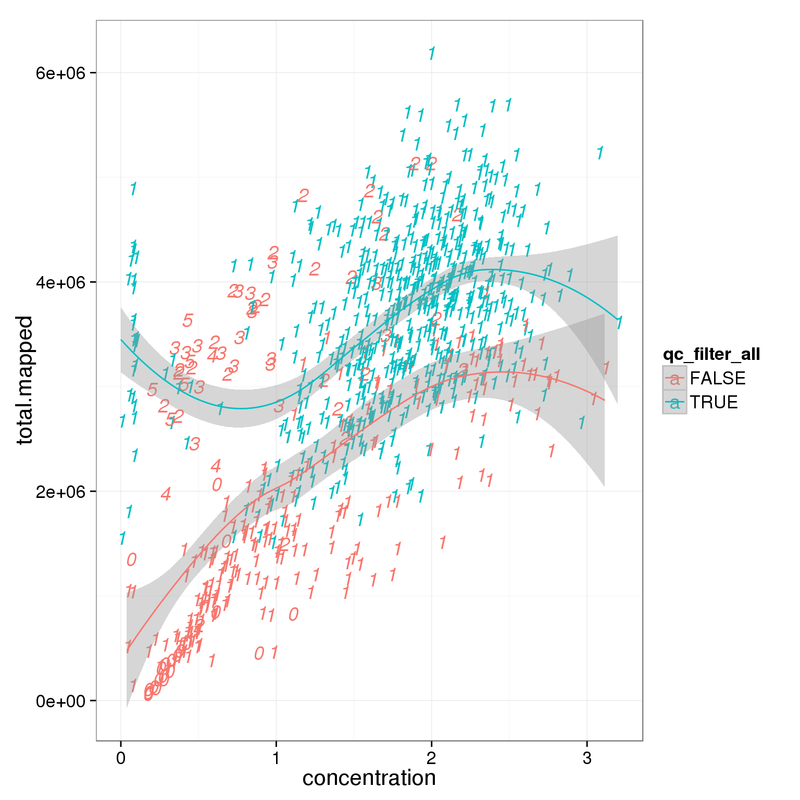 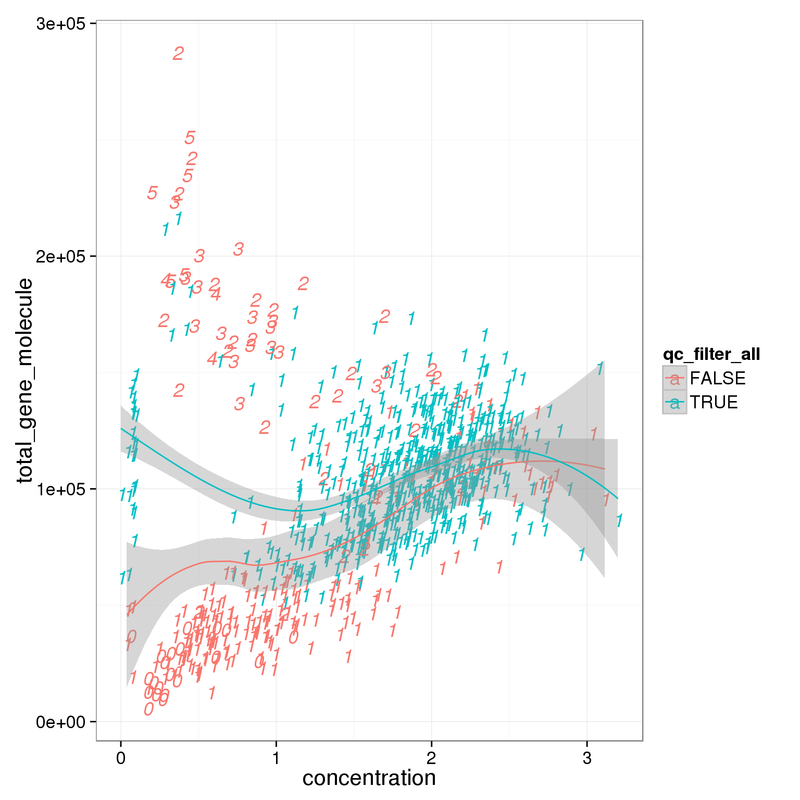 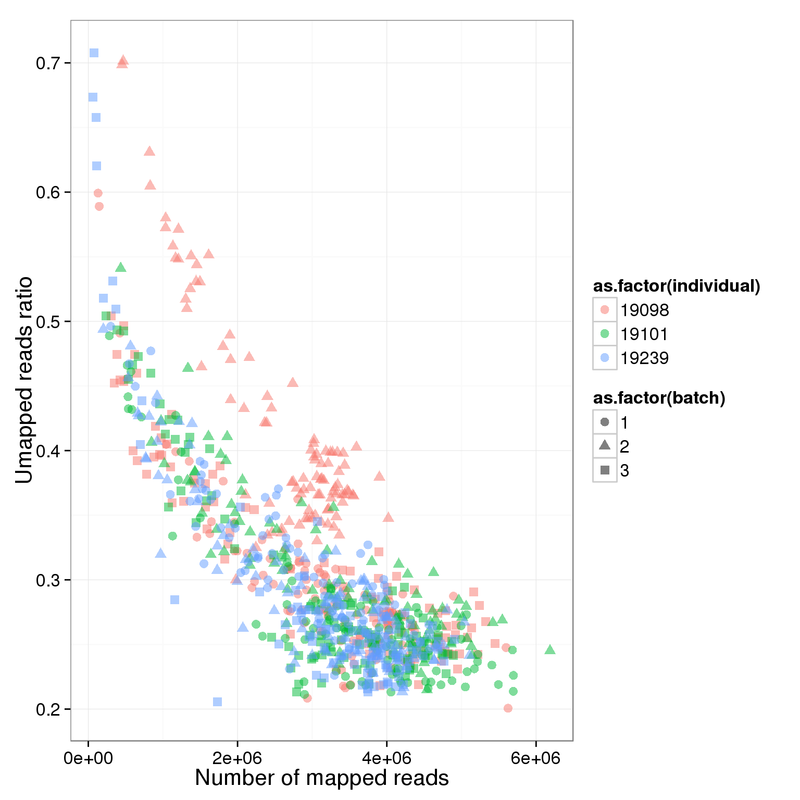 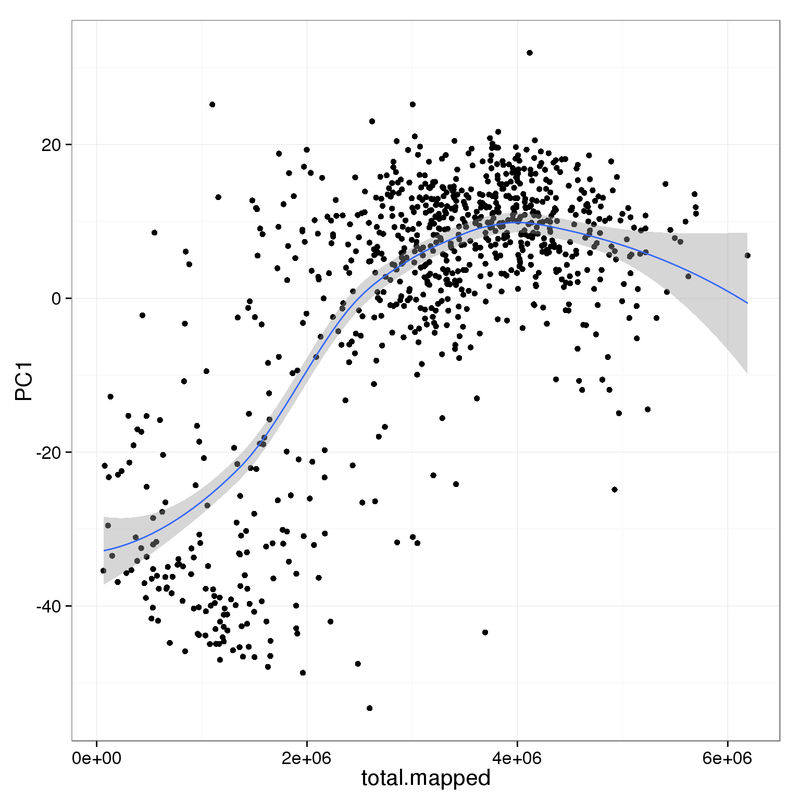 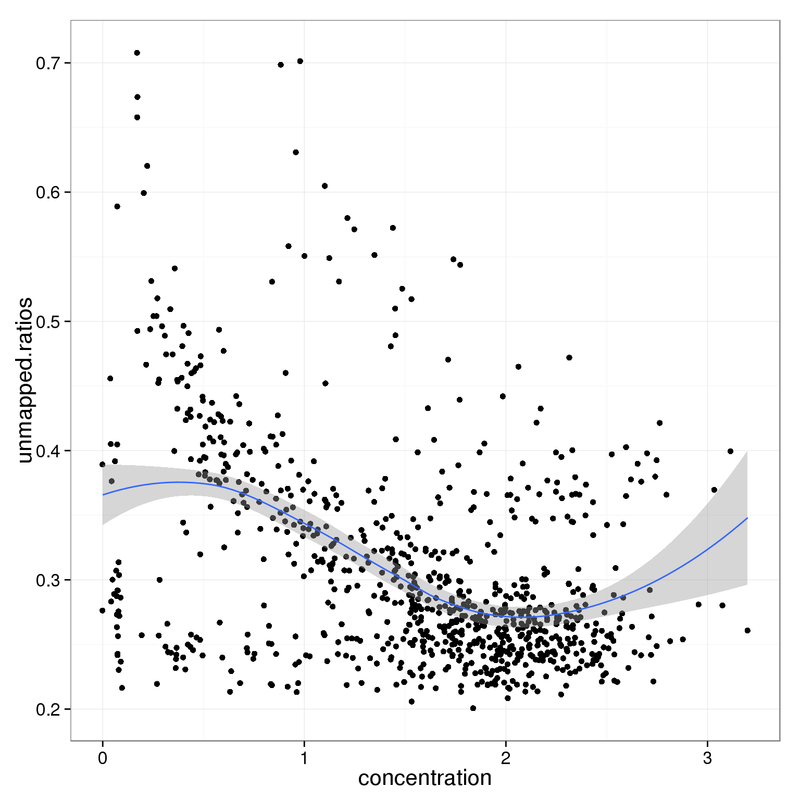 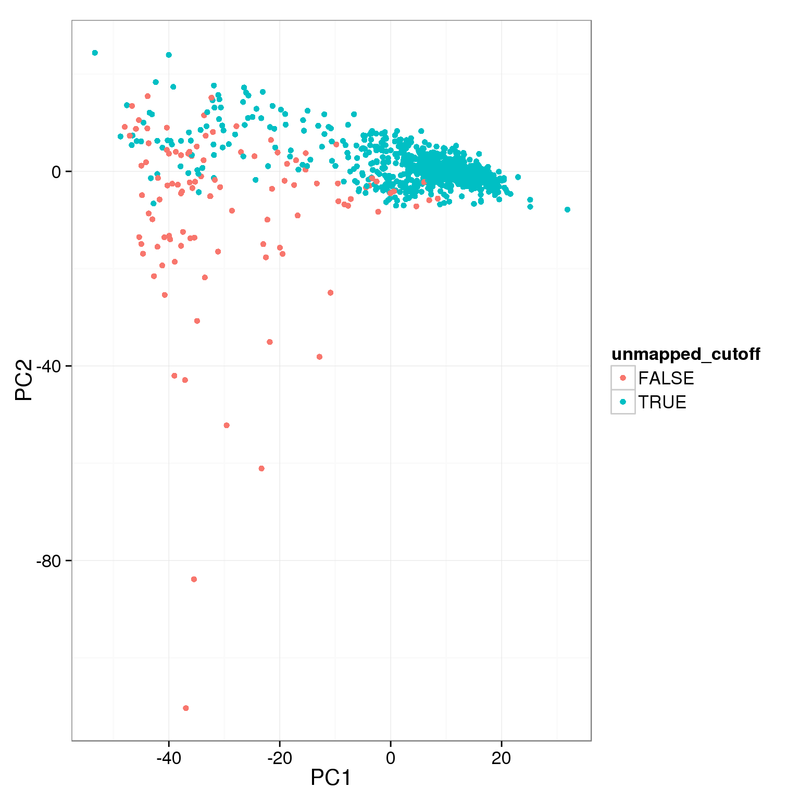 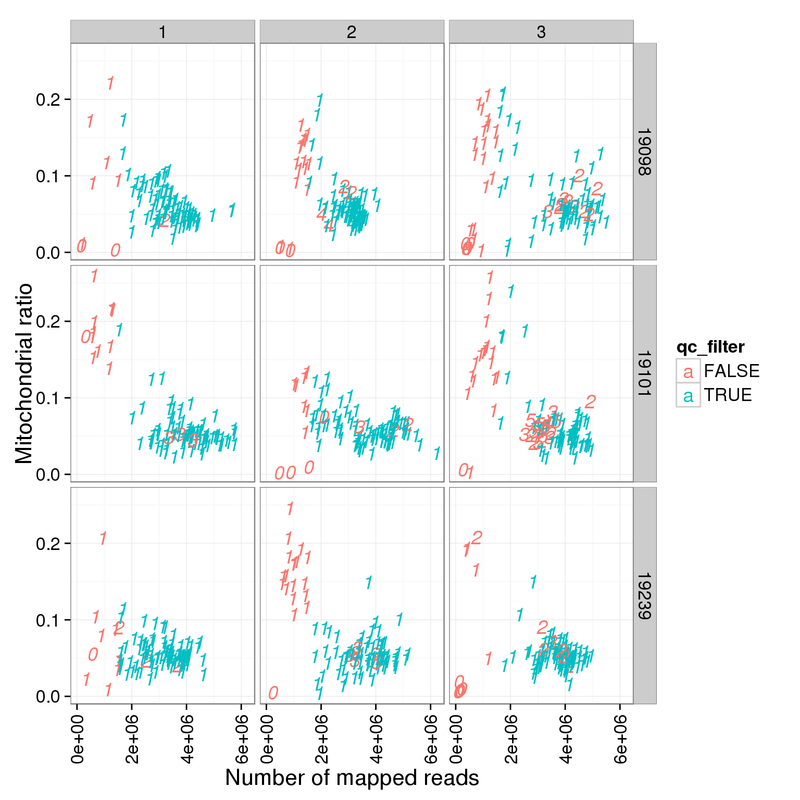 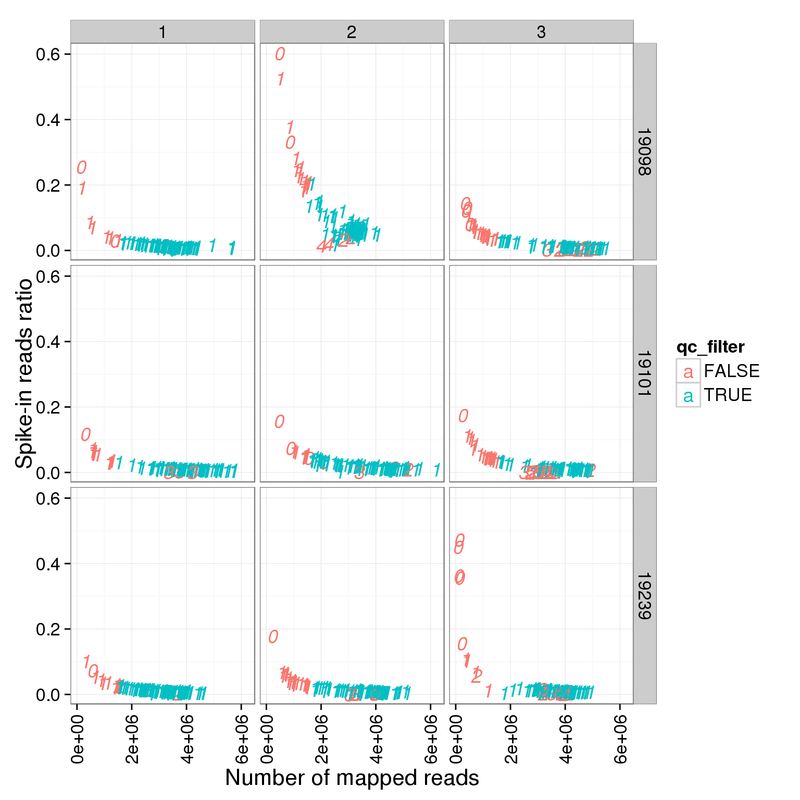 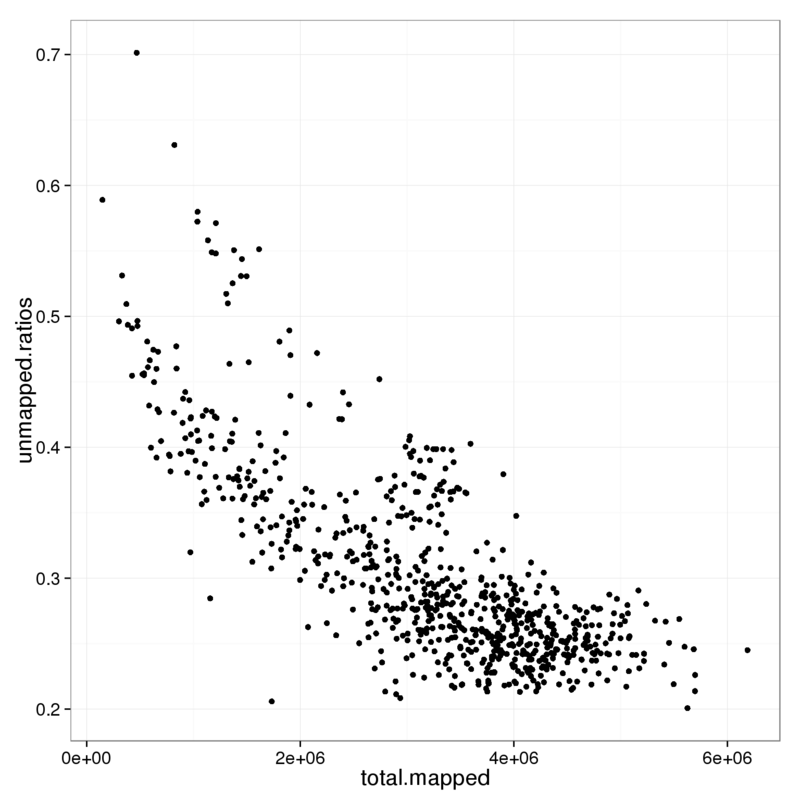 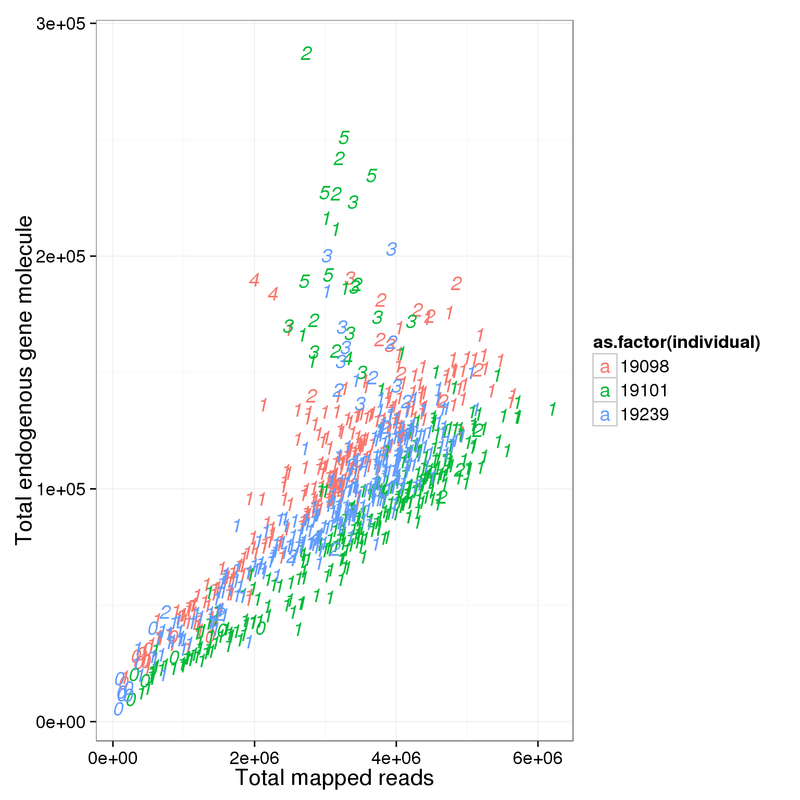 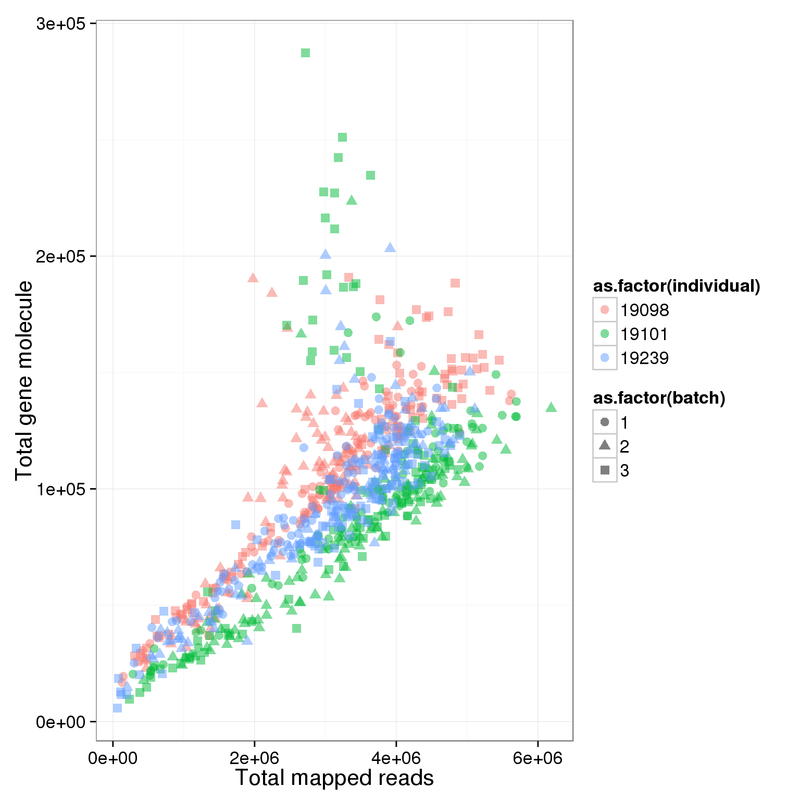 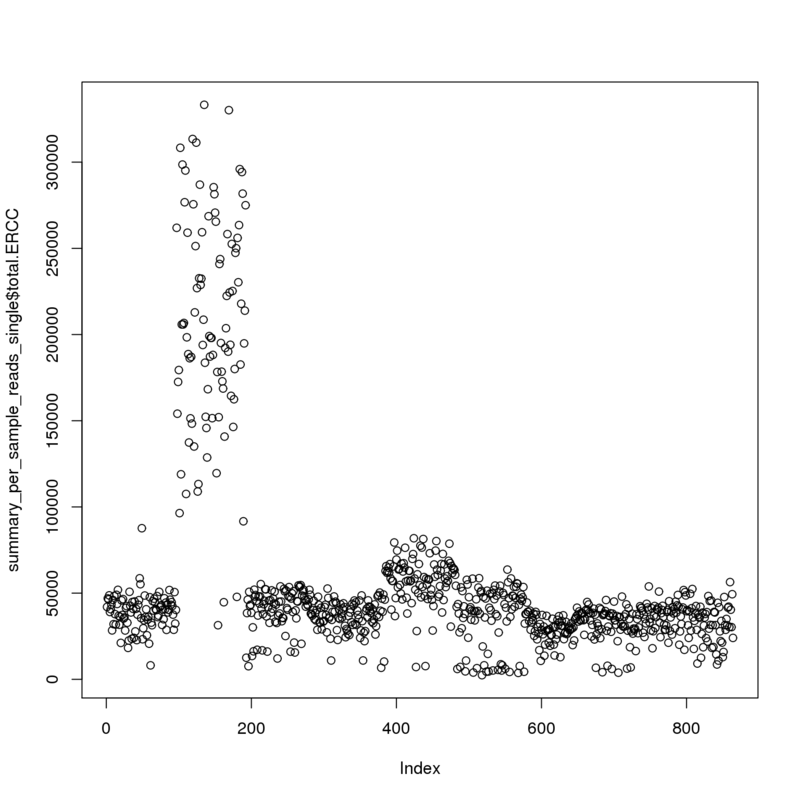 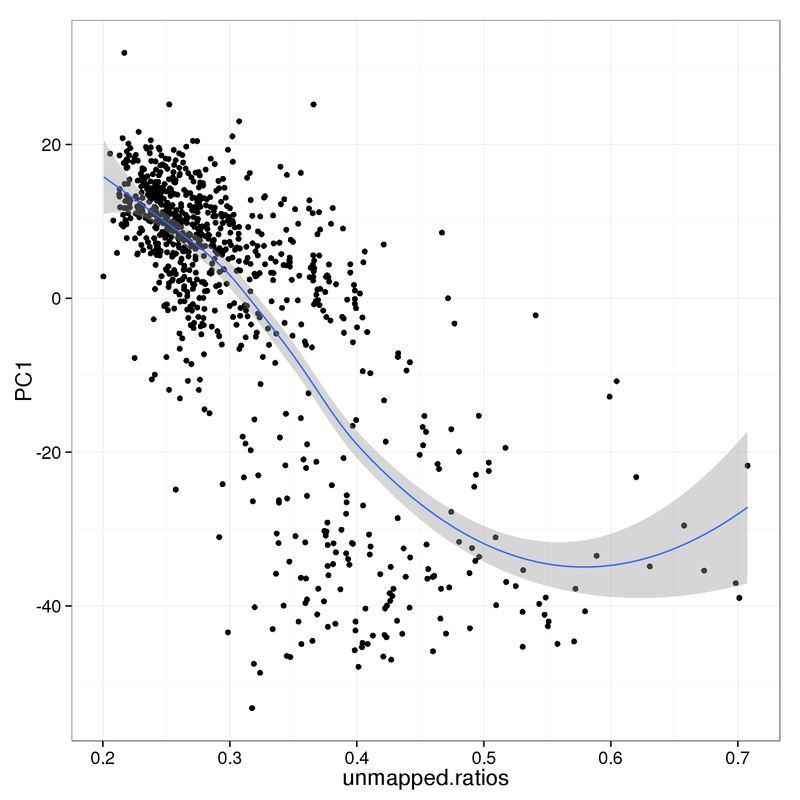 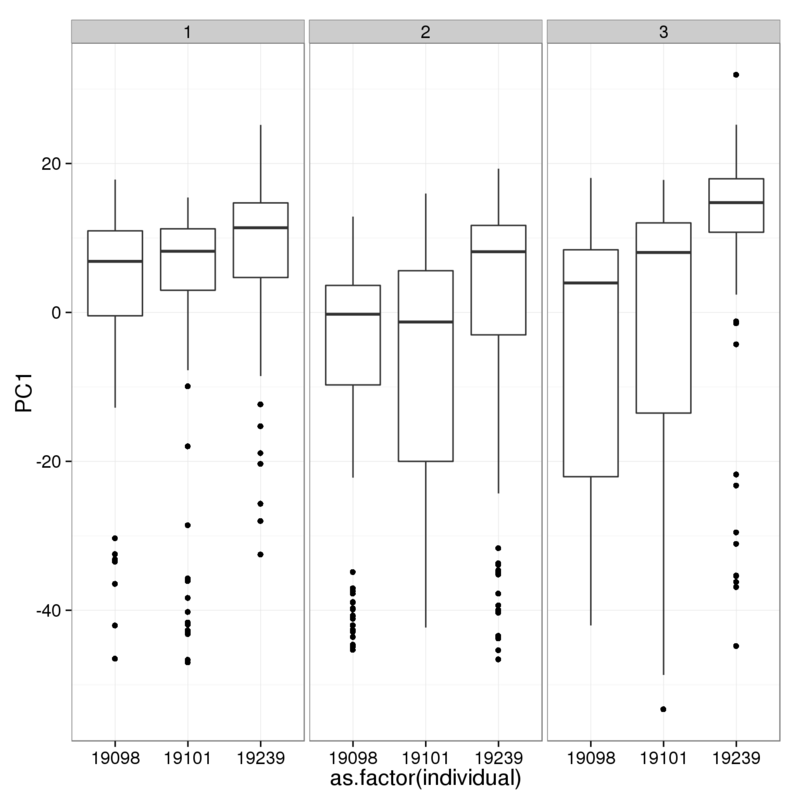 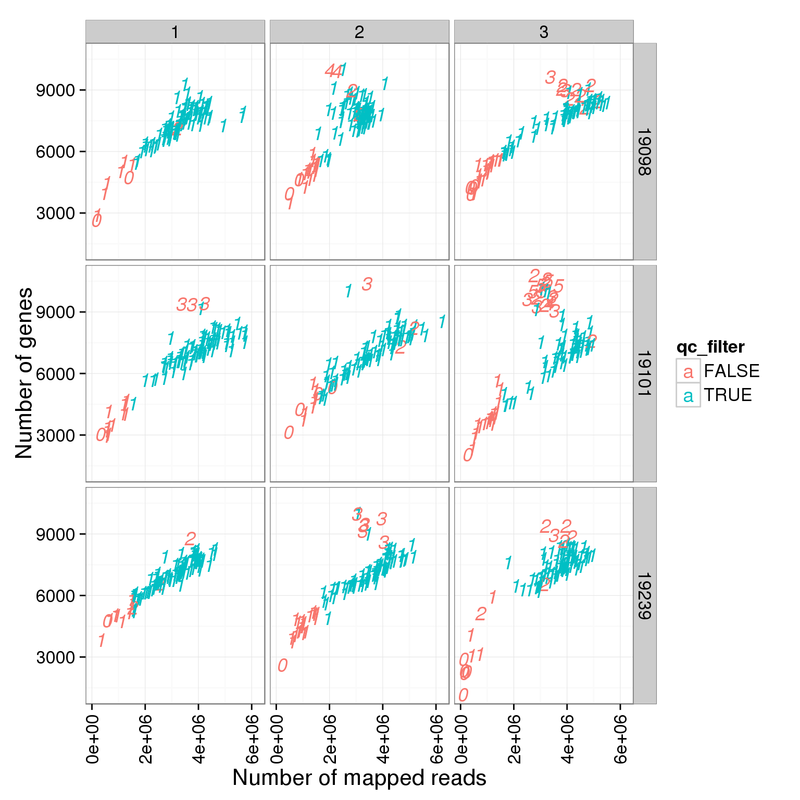 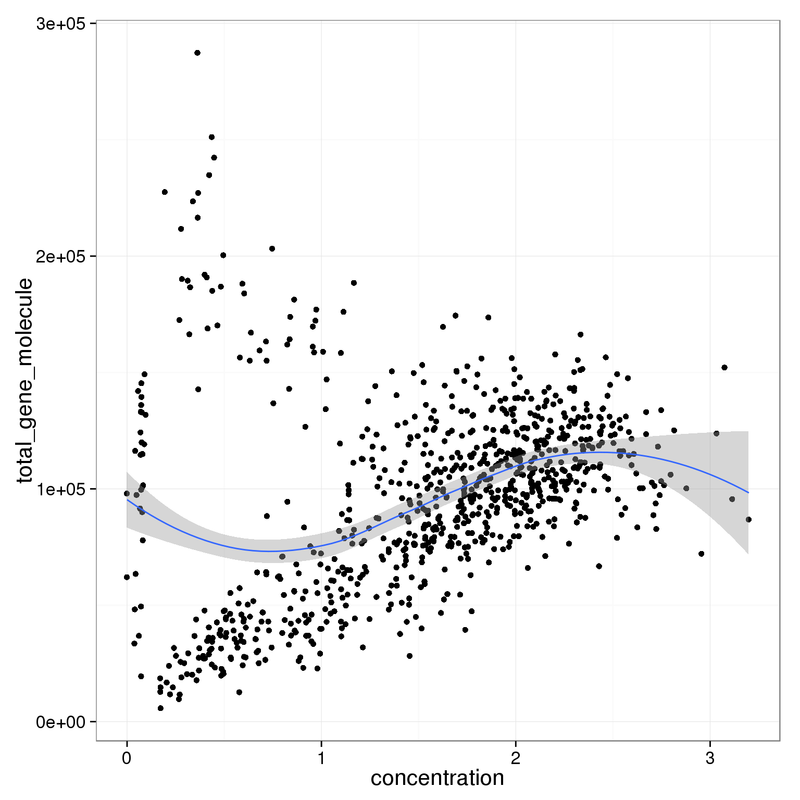 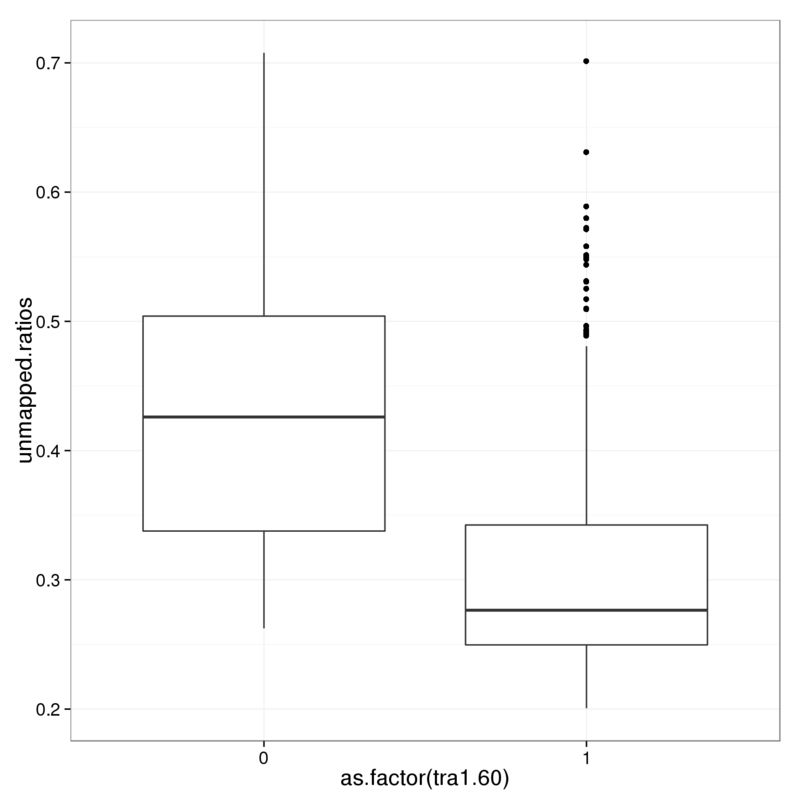 PC1 is negatively correlated with the ratio of unmapped reads. 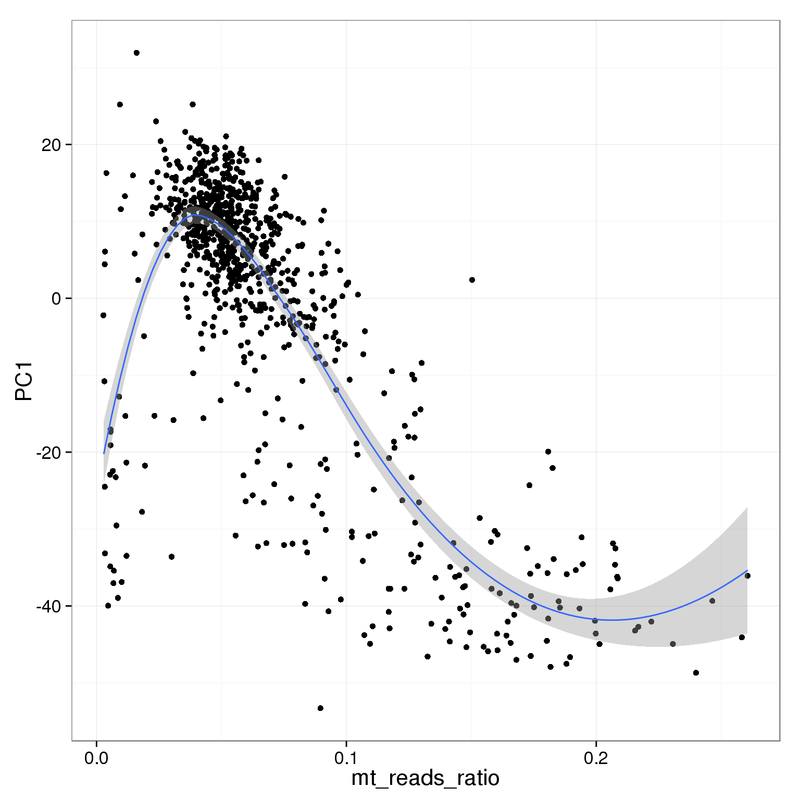 PC1 is positively correlated with the total number of mapped reads. 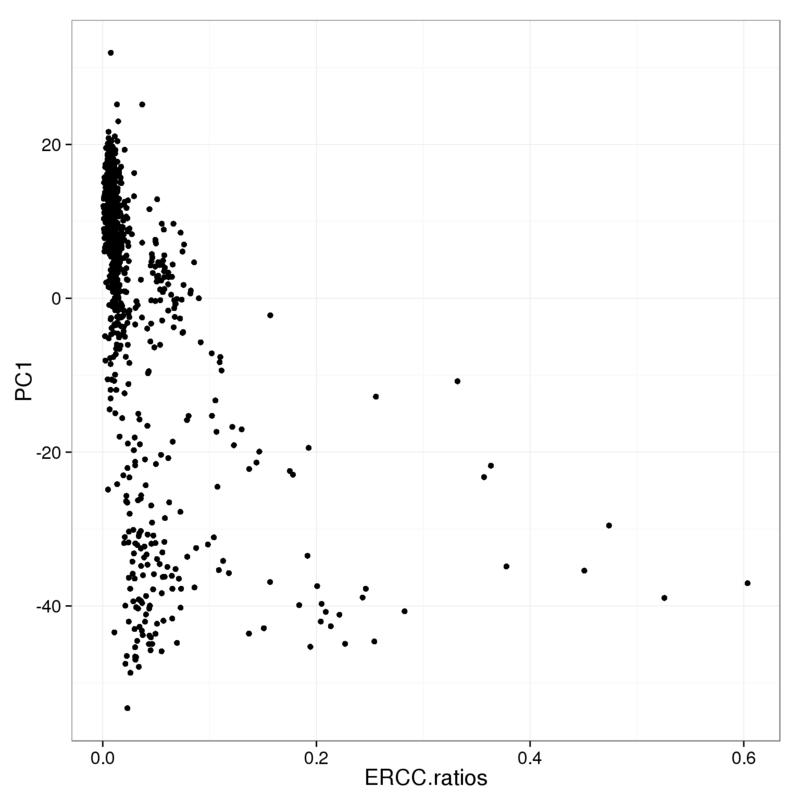 Using various simple filtering cutoffs, it is not possible to capture all the cells that have low values of PC1. 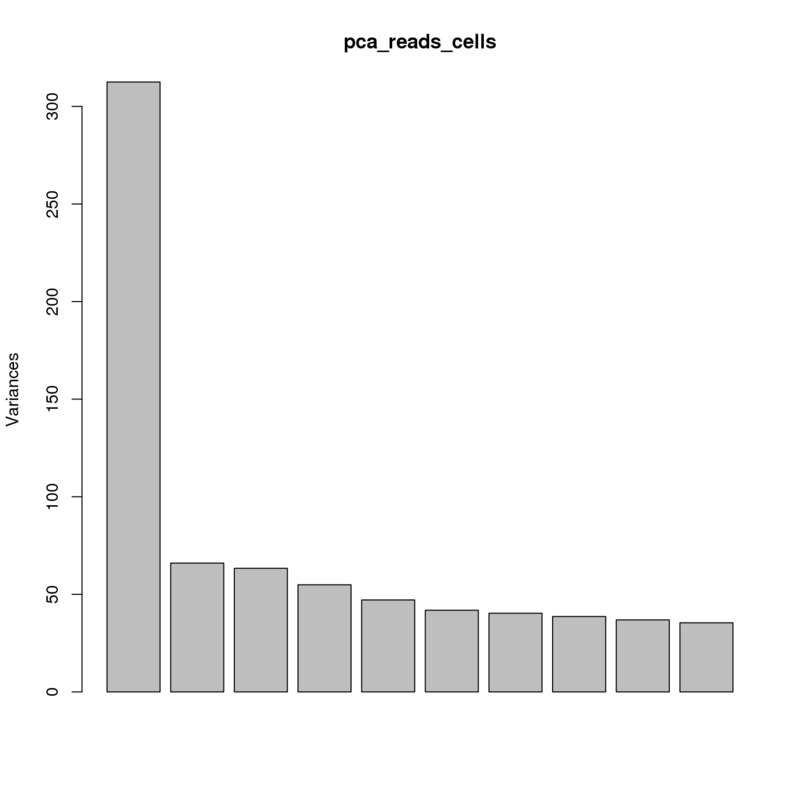 The two cutoffs, total reads and cell number, largely overlap. 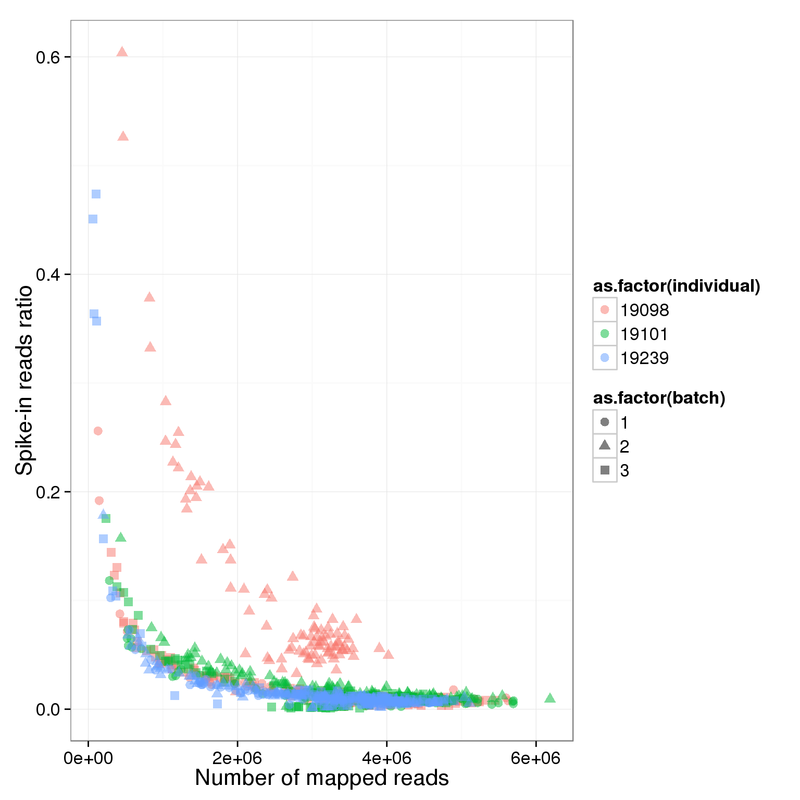 Add the third cutoff, 6000 genes detected, help a bit. 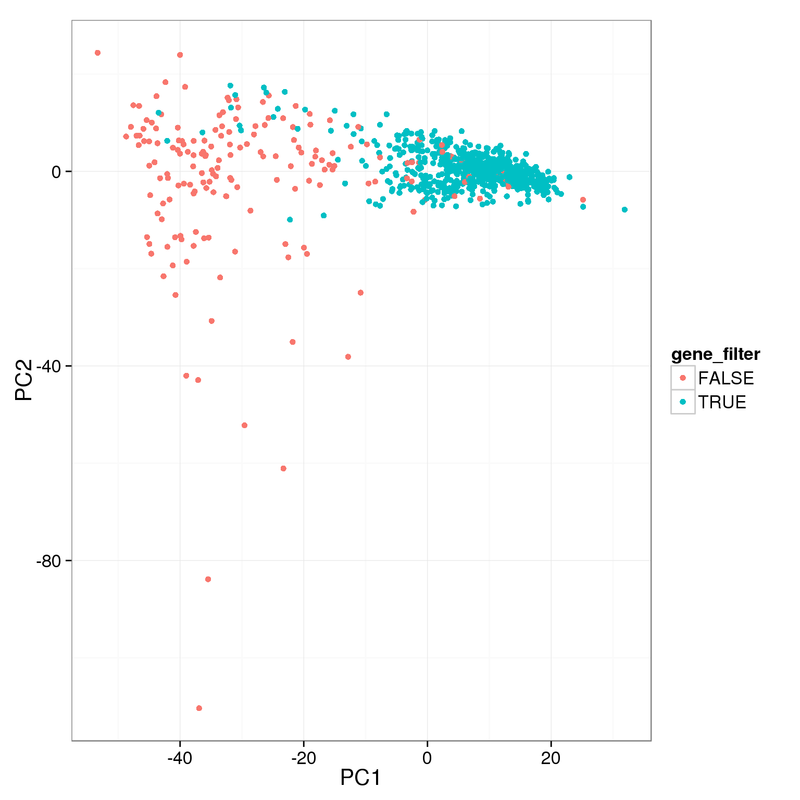 How many cells do we keep from each individual and batch using this filter? 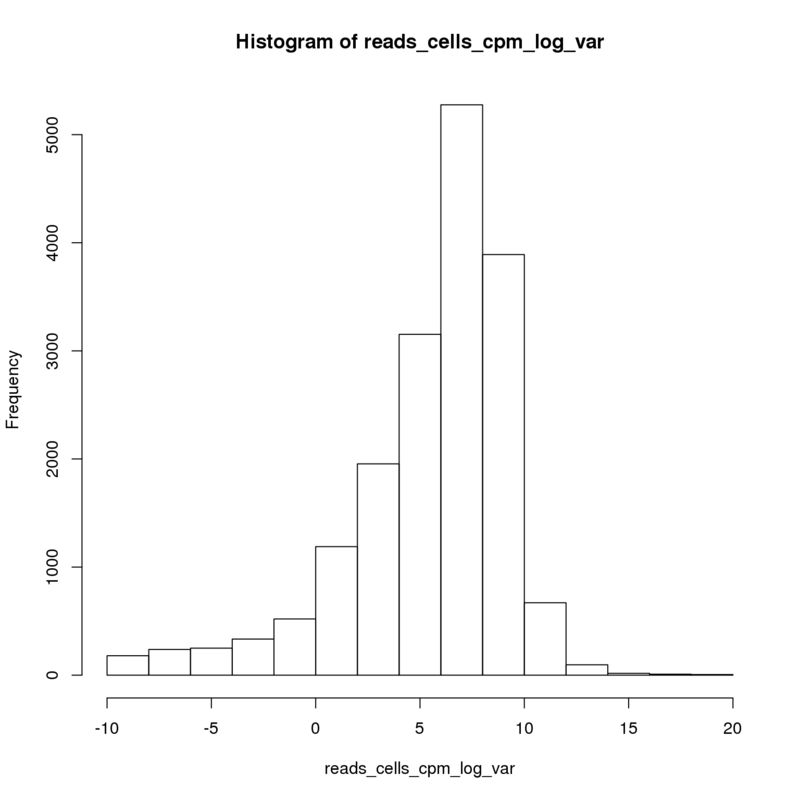 Output list of single cells to keep. 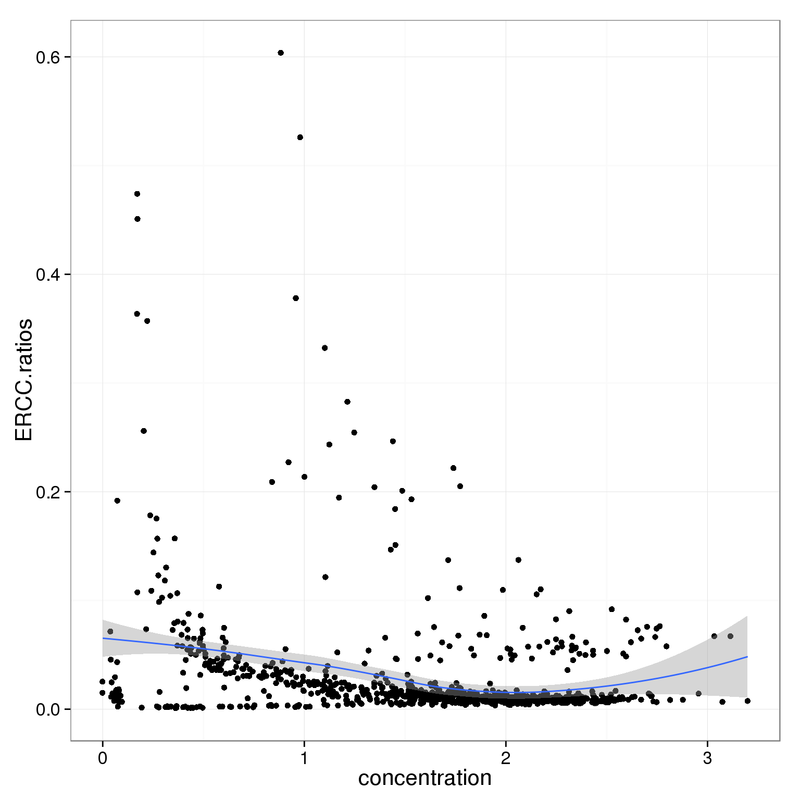 Investigate whether sample concentration can be reflected by total mapped reads or total molecule counts. 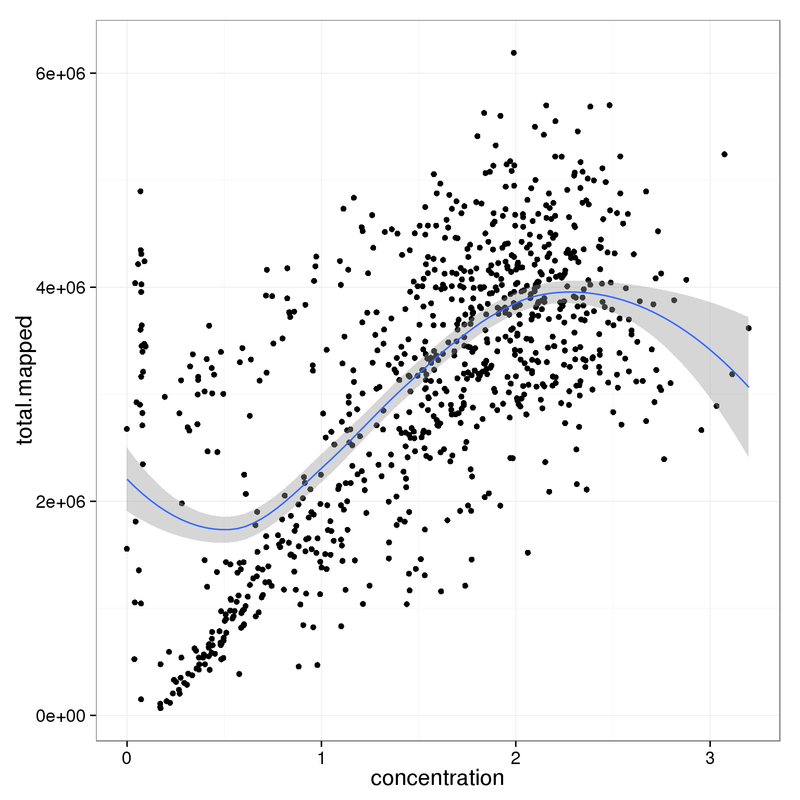 Maybe in the bad quality cells, but not really in the good quality cells.